Akit's Complaint Department: August 1st is End of "BART to Muni" Paper Transfers? August 1st is End of "BART to Muni" Paper Transfers? 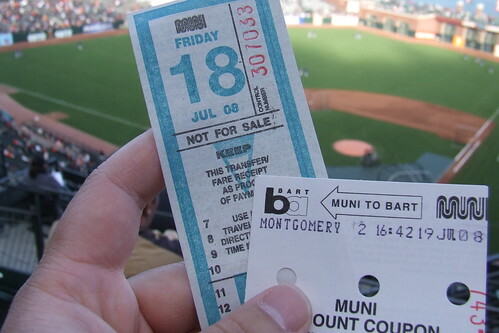 We should be familiar with the paper "BART to Muni" discount transfers: If you ride BART and exit at any of the San Francisco stations, you can get a white paper transfer to receive a 25 cent discount riding Muni away from the BART station, and a 25 cent discount for a return trip back to the station. At Daly City BART, passengers can get a free yellow colored transfer for a free ride on Muni's 28, 28L and 54 lines and a free ride back within 24-hours. In February, the MTC and TransLink/Clipper board posted a list of deadlines that transit agencies must meet to transition paper media to be electronic. On number seven, it mentions that by August 1, 2010, all paper "BART to Muni" transfers must be converted to Clipper only. Now that we are just a few days away from August 1st, is BART and Muni ready to give-up the paper transfers and force people to use Clipper cards? From looking at the BART and Muni websites, there is no confirmation. The SFMTA website simply says the word "soon." While BART and Muni whine like little children, Golden Gate Ferry has followed through on their goal to end paper transfers valid on Muni in favor of Clipper cards on April 1, 2010. I took the BART from Millbrae to Daly City yesterday, and sure enough, the free paper BART-to-Muni transfers were still there. Will be heading to the city again tomorrow, hopefully it will be available yet another day! Muni was Excellent Today - I'm Not Kidding! Can Muni Simplify the Proof of Payment Policies?